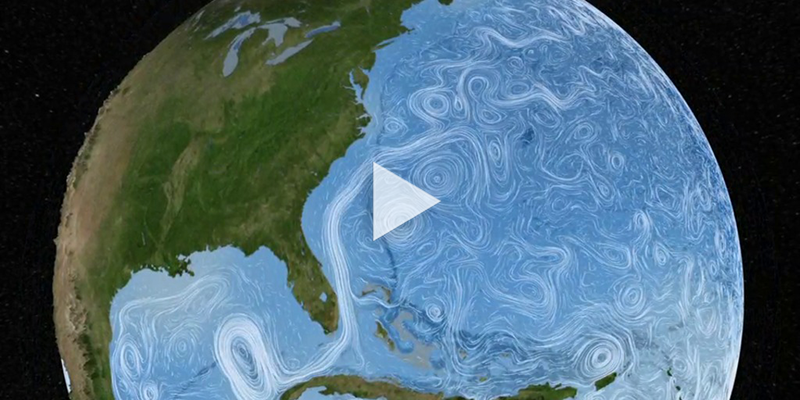 Although everyone knows that seawater is salty, few know that even small variations in ocean surface salinity (i.e., concentration of dissolved salts) can reveal important information about changes in Earth's water cycle, ocean circulation and climate. Throughout Earth's history, the weathering of rocks has delivered minerals, including salt, into the ocean. Over decades to centuries, the amount of salt in ocean basins has remained relatively constant. On the other hand, processes that move water into, out of, and around the ocean are in constant motion. As a result, monitoring salinity allows scientists to better understand these processes and how they are changing. The impact of such changes could include altering ocean circulation patterns which move heat around the globe, drive Earth's climate, and affect our daily lives. Some water cycle processes, including evaporation of ocean water and formation of sea ice, increase the ocean's salinity. These salinity-raising factors, however, are offset by processes that decrease salinity: input of fresh water from rivers, precipitation of rain and snow, and melting of ice. On land, water cycle processes are tied to vegetation patterns: deserts occur in regions where evaporation is high and rain forests occur in areas of high precipitation. Similarly, over the ocean, the regional differences between evaporation and precipitation are correlated with patterns of sea surface salinity. This can be seen by comparing historical maps of ocean surface salinity with data showing the imbalance between evaporation and precipitation. In general, ocean regions dominated by evaporation have higher salinities and areas with high precipitation have lower salinities. A year of salinity measurements from Aquarius. Several recent studies have suggested that seawater is becoming fresher in high latitudes and tropical areas dominated by rain, while in sub-tropical high evaporation regions, waters are getting saltier. Since August 2011, NASA’s salinity instruments have delivered steady and reliable information about the vast ocean where about 86% of global evaporation and 78% of global precipitation occur. This continuous coverage has allowed scientists to monitor variations in the water cycle and determine if it is indeed accelerating in response to climate change. 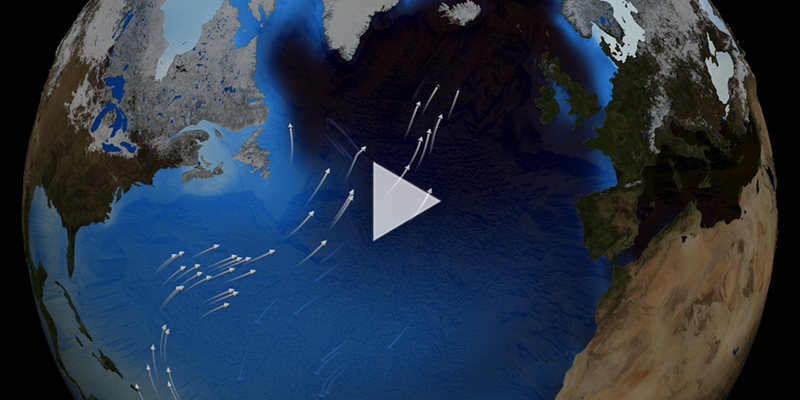 Surface winds drive currents in the upper ocean. Deep below the surface, however, ocean circulation is primarily driven by changes in seawater density, which is determined by salinity and temperature. In some regions — such as the North Atlantic near Greenland — cooled high-salinity surface waters can become dense enough to sink to great depths. Perturbations to this process, for example from melting of polar ice and associated decrease in seawater salinity, could have significant impacts on Earth's climate. This is because the ocean holds and transports a tremendous amount of thermal energy: the heat stored in the top 3 meters (10 feet) of the ocean is equivalent to the amount held by the entire atmosphere, with an average thickness of about 100 kilometers (62 miles). NASA's program to monitor salinity is crucial because the geographic coverage from in-water observing systems (e.g., ships, buoys) is not extensive enough to fully understand how changes in global salinity affect climate, and vice versa. Excess heat associated with the increase in global temperature during the last century is being absorbed and moved by the ocean. Surface ocean and atmospheric temperature changes may cause evaporation to intensify and, as a result, significantly alter sea surface salinity and ocean circulation patterns. Ocean change may seem like a "faraway" problem but, as the major driver of our planet's climate, it has the potential to impact humans everywhere. Who Else is Measuring Salinity? Ocean-observing satellite instruments detect surface seawater properties to depths of about 1 cm (~0.4 in). Given the dynamic nature of Earth's seas, it is important to link these "skin" measurements with other observations of the upper ocean. 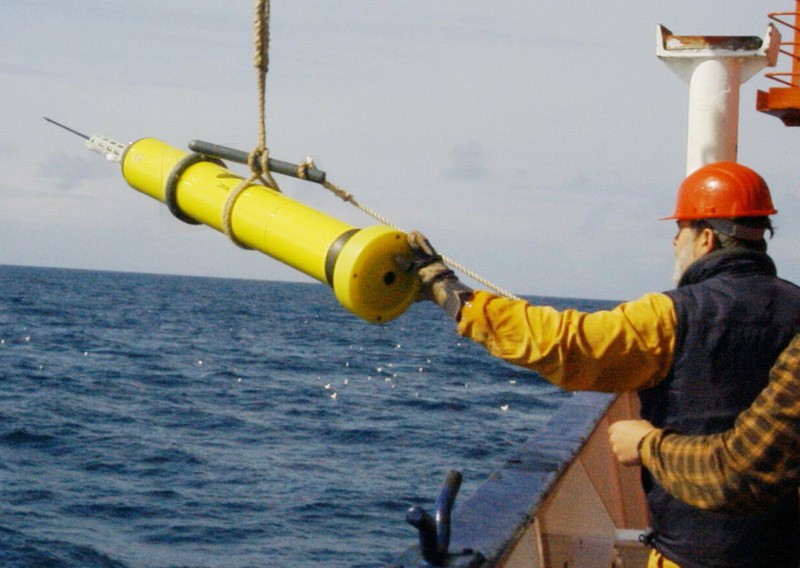 A key advance in this effort is a special series of Argo profiling floats developed at the University of Washington, which are designed to acquire salinity and temperature in the upper 10 cm (~4 in) of the ocean. These enhanced floats help to "close the gap" between satellites and conventional Argo floats whose shallowest data are acquired at a depth of 3-5 m (~10-16 ft). Currently, only about 1% of more than 3,000 Argo floats in Earth's ocean have this enhanced capability. However, SPURS has demonstrated the promise of using satellites and Argo together to improve our knowledge of how freshwater cycles between the atmosphere and the ocean. 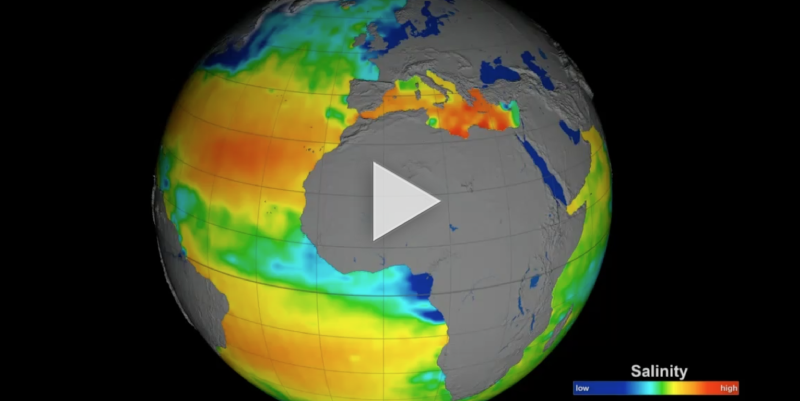 A key goal of the oceanographic community is to combine NASA's salinity measurements with its European Space counterpart, Soil Moisture and Ocean Salinity (SMOS), to produce an even more accurate picture of ocean salinity. 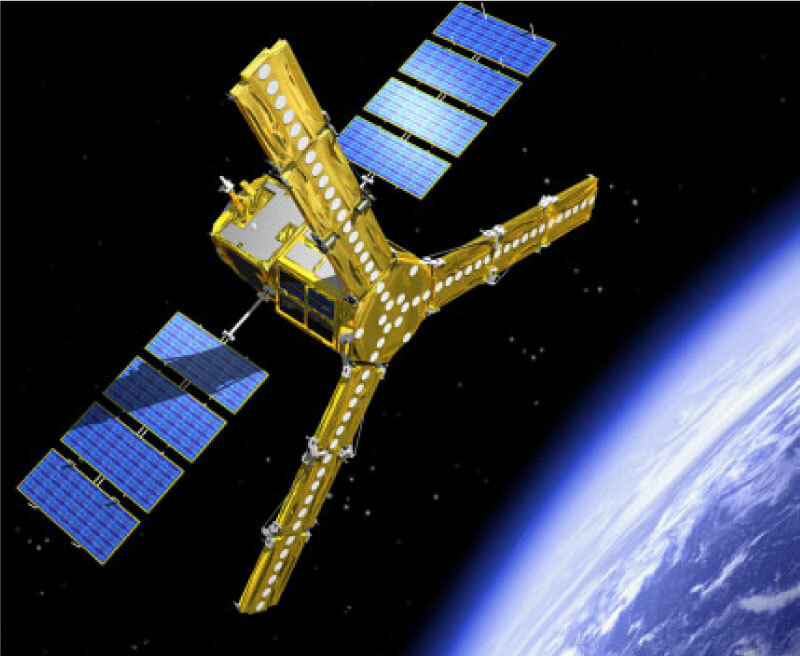 Launched in November 2009, the SMOS satellite collects ocean salinity data at the same frequency as SMAP and Aquarius, but uses a different technology: an interferometric technique in which the signal from many small antennas is used to achieve the resolution of a large antenna. Despite the difference in technology, SMOS data are very complementary to SMAP and Aquarius data. In fact, early indications are that inter-comparison of results from these two satellites are crucial to better understanding the biases between ascending passes and descending passes seen in both missions, the cause of which may be geophysical in nature. Scientists representing both NASA and the European Space Agency have concluded that providing observational-based measurements that are harmonized between satellite and in situ instruments will be the most help to the scientific community.